In this painting the eldest of the Ents, Treebeard befriends the Hobbits Meriadoc Brandybuck and Peregrin Took. It is at this moment when Treebeard learns that Saruman is cutting down the forest, and the hobbits need help to defend it! 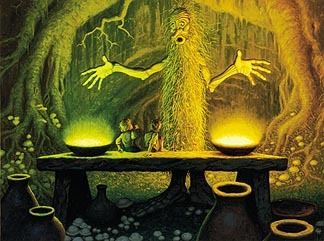 Treebeard's strength and passion would lead the Ents to attack Isengard in the Last March of the Ents. This scene was an interesting project for Greg and Tim, who looked for a balance between human and tree. This is a painting from August of the 1976 Tolkien Calendar, which was painted by Greg and Tim Hildebrandt. This painting was signed by Greg and Tim Hildebrandt prior to Tim's death in 2006. We are selling this painting on consignment for one of our collectors. This painting has not been available for sale since the 1980's! Published by Ballantine Books. Signed by Greg and Tim Hildebrandt.